There are a lot of reasons why so many people fail shortly after starting a home business. 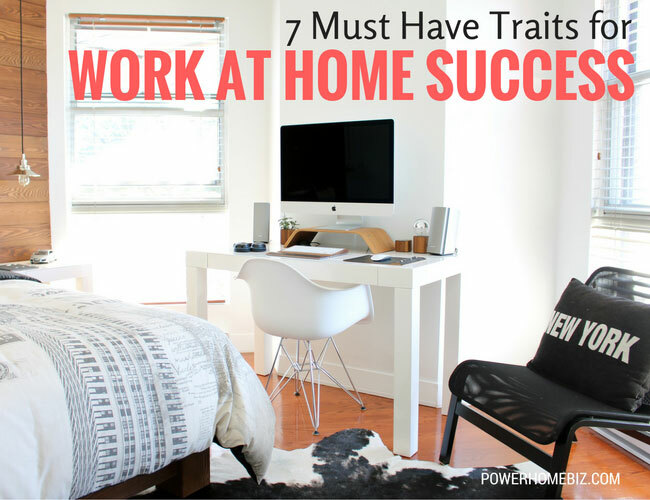 In order to achieve your work at home dreams there are certain traits you must possess or acquire. I have listed 7 must-have traits that I consider to be the most important to succeed as an entrepreneur. Go through the list carefully. Truly think about whether or not you have the desired trait. If you find that there are some that don t describe you then decide how you are going to change in order to acquire it. Don t try and fool yourself into believing you already have all these traits unless you truly do. Fooling yourself will also be cheating you out of achieving your home business goals. Working at home means that you don’t have a boss or co-workers to keep you on task. When you are the boss it is easy to do something other than work. This is especially true in a home business where you have your personal life all around you. You must discipline yourself to do certain tasks at certain times every day. Do not let your home life interfere with your business just because you work at home. You must avoid procrastination all costs! Once again you do not have a boss or other authority figure to keep you on task. A luxury of being your own boss is that you get to pick your working hours. Make sure you aren’t putting off work until tomorrow or the next day. Doing this will squash your home business dreams faster than anything. You must establish a workload to get done every day and do it. People are always starting this or that but hardly anyone ever finishes once it gets a little rough. Having a home business has a lot of benefits but first you have to get through all the hurdles in the beginning. There are few things harder than building a home business from the ground up. There are also few things more rewarding once you have succeeded. It will get tough at times so you must have persistence. You can hope and wish to gain financial independence for the rest of your life but it will never happen until you desire it. You must determine exactly what you want for your financial future and then let it become your obsession. Do not leave any room for failure or you will do just that fail. In order to build a solid business, you must have a central purpose. It’s easy to try and do a hundred different things at one time but it gets you nowhere in the end. People that fail don t have a defined purpose or goal set for what they are trying to do. When you try to do too many things at once, without really knowing what you are doing it for, then you will quickly find that nothing is working. Many people just give up at this point. You don’t have to have a college degree to work at home. In fact, starting a home business really doesn’t require you to have much of a formal education at all. However, you must educate yourself tremendously on your particular business topic. There is going to be a lot of things you need to know in your business. Most of it can be learned on the internet or with home study courses. You must thoroughly enjoy what you do in order to succeed at it. There is an old saying that enthusiasm is contagious. With enthusiasm, you will have much more success getting people to do business with you. The whole purpose of working at home is to do something you like, under your own terms, so pick something you are enthused about. Now, go back and read the list again. Do you lack any of the desired traits? Do you possess any of the negative traits? Find someone who knows you very well and is comfortable giving you constructive criticism. Have them go over the list with you to give you an outside perspective on yourself. If you find anything you need to work on, get started immediately. This is no time to procrastinate. Your future is on the line!